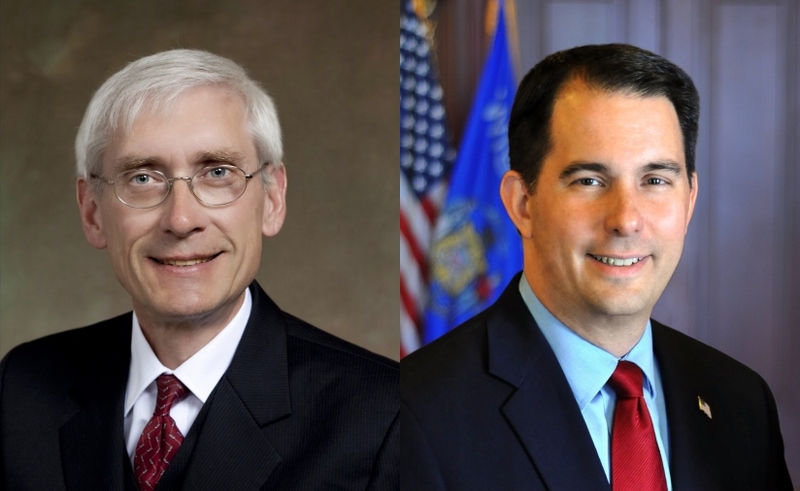 The results show Tony Evers edging out a close win over Scott Walker for governor, but how did it happen? Let’s take a look at seven key figures that illustrate how Democrats managed to sweep the statewide races in Wisconsin. That’s the number of Milwaukee residents that voted in the election, an 8,000-vote increase over the 2014 midterm election that pitted Mary Burke against Walker. Evers and lieutenant governor nominee Mandela Barnes received an additional boost as voters collectively cast over 78 percent of their ballots for the duo, versus 76 percent for Burke and John Lehman. Compared to 2014, Democrats picked up 11,000 from Milwaukee. It all comes down to Waukesha County, and it largely did again Tuesday. Walker and Kleefisch, who hold their election night parties in the county, pulled in 147,000 votes from the Republican stronghold in 2014. And Tuesday, they managed 146,000. Not a big difference, until you factor in the percentage change. Walker and Kleefisch got 72 percent of the vote in 2014, but only 66 percent in 2018. That’s because Evers did better than Burke in the county: In 2014, she garnered 54,500 votes, while Evers pulled in 72,000 yesterday. That’s 17,500 more votes for the Democratic candidate coming from the Republicans’ base. Donald Trump (47 to 47) and Walker (50 to 48) both won Kenosha County (Trump by a tiny margin) to win elections in 2016 and 2014 respectively. That didn’t hold on this time. Evers won the swing county 51 percent to 46 percent, adding 3,000 votes to his statewide lead. The incumbent governor lost liberal Dane County by approximately 102,000 votes in 2014, a big, but survivable gap. That wasn’t the case in 2018 as Walker not only became less popular (going from 29 to 23 percent of the vote), but saw the number of voters increase, leaving him with a staggering net loss of 151,000 votes. The results haven’t been certified yet, but should Evers’ winning margin exceed 1 percent, Walker won’t be able to request a recall. The difference currently stands at 1.16 percent. Thanks to a change in state recount rules, signed into law by Walker in late 2017, he likely won’t be able to request a recount. If the margin was within 1 percent, Walker, the losing candidate, could call for a recount that his campaign would have to pay for. If it was within .25 percent, it would trigger an automatic recount that the state must fund. The measure was put into effect in response to a recount requested by Green Party presidential candidate Jill Stein who garnered less than 1 percent of the vote in Wisconsin, but paid for a $3.5 million recount. The 2016 recount gave Trump an additional 131 votes. Prior to Tuesday, how many African Americans had won a statewide race in Wisconsin? One. Vel Phillips won the race for Secretary of State way back in 1978, only to lose office after one term. She first won office to the Milwaukee Common Council by hiding the fact she was both black and a woman. She’s now joined by Mandela Barnes, who if the unofficial results stand, will serve as the Lieutenant Governor with Evers. Barnes, an active user of social media, didn’t hide anything about his background. Despite newspapers declaring him dead, putting him in the wrong race, giving him the photo of an older, white male or failing to mention him entirely, he won a competitive primary earlier this year to become the nominee. Phillips, a political giant in Milwaukee for decades, unfortunately isn’t around to celebrate the milestone. She passed away earlier this year at the age of 94. Wisconsinites voted in record numbers in the 2018 midterm election. Over 2.7 million votes were cast, breaking any non-presidential election total, including the 2.5 million votes cast in the 2012 gubernatorial recall. From urban Milwaukee County to rural Clark County, voters showed up in record numbers and made their voices heard. If you voted yesterday, give yourself a pat on the back. Whether your candidate won or lost you did your civic duty. And yes, your vote did count even if you didn’t post a photo of your I Voted sticker on Facebook. For more on the election, see my colleague Bruce Murphy‘s article examining 33 winners and losers. This clever mixture of #s and ideas was thoughtful and thought provoking. Take an extra day off if you can to reflect on the wonders of #s and ideas.